Gellibrand is well-known for founding the Remembrance Club in 1923, which became Legacy – the national charity devoted to supporting the families of deceased and incapacitated veterans. 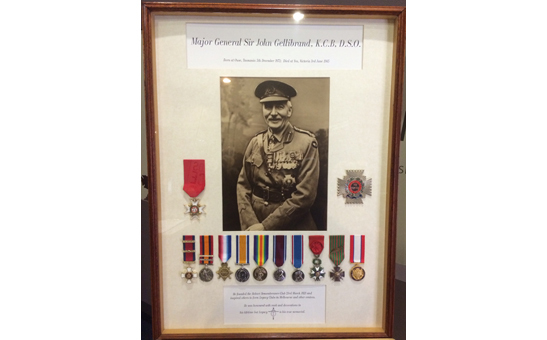 TMAG is immensely grateful to Hobart Legacy and the Gellibrand family for their generous donation of medals awarded to Gellibrand as a result of the contributions he made during the Boer War and World War 1. Gellibrand’s medals are a significant addition to the museum’s existing collection of World War medals, with his American Distinguished Service Medal being unique to TMAG. 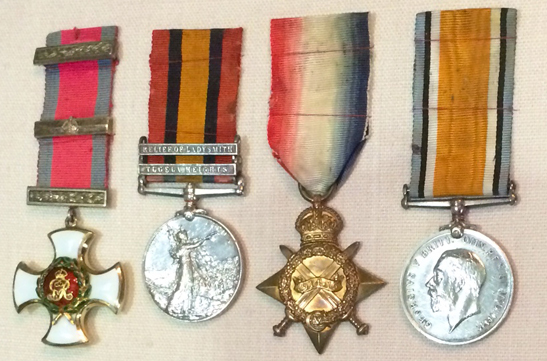 This important group of medals complements other items related to Gellibrand already in the museum’s collection, including an oil painting of him and another of the Gellibrand children, as well as a tunic from the Boer War and his kit bag from World War 1. Members of the public will be able to see the Gellibrand medals when they are presented as part of TMAG’s World War 1 commemorative exhibition, opening in 2015. This exhibition will be a focal point for Tasmanians to commemorate and learn more about the impacts of the war on both Tasmania and Tasmanians, and will focus on the key theme of the ‘war at home’. It is hoped that through the exhibition, visitors will be encouraged to reflect and gain a deeper understanding of this important part of Tasmania’s history. Keep an eye on this website for further announcements about the exhibition in the months ahead.